Burns v. Franklin Square Hospital Center, Inc.
Franklin Square Hospital Center, Inc. Pulmonary and Critical Care Associates of Baltimore, P.A. A woman presents to the emergency room at Franklin Square Hospital four days after a lap chole. Diagnostic testing confirms that she has a pulmonary embolism: a blockage of an artery in the lungs. The Defendant doctors in this case are the attending emergency room physician and a pulmonary and critical care specialist. The Defendant doctors consult with each other. They decide to transfer the woman to the University of Maryland for surgery. The pulmonary and critical care specialist help make this decision without having examined the woman. Arrangements are made for the woman to be transferred, however prior to the transfer her condition deteriorates. Her heart rate is very high and her blood pressure is very low. Despite her condition, the doctors check her vitals sporadically. While still at Franklin Square Hospital, the woman sustains cardiac arrest and is pronounced dead. The claimants, the woman's parents, say that the doctors violated the standard of care. They claim that given their daughter's condition, her vital signs should have been checked in five minute intervals. They say that the doctors should have ordered the use of vasopressors, drugs which constrict the blood vessels, to support their daughter. The claimants file a survival action as personal representatives of their daughter's estate. They also file a wrongful death lawsuit on their own behalves. Both of these claims are filed in Baltimore County. The key to the case is whether the doctors at Franklin Square properly supported the patient before the transfer to Hopkins. The claim seems to revolve around the lack of vasopressor drugs which Plaintiff's expert says was warranted because she was hypotensive. A pulmonary embolism can be an extremely difficult condition to diagnose. These emergency room doctors nailed the diagnosis. Franklin Square's expert will almost certainly argue that this woman was going to die regardless of the care. 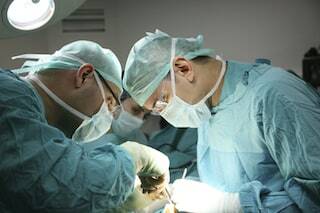 If you have been harmed from a surgical error, we can help you get the justice and compensation you deserve. Miller & Zois has a history of results, earning large verdicts and settlements in surgical malpractice injury and wrongful death cases. Speak to a attorney today at 800-553-8082 or get a free, no obligation online case review. Looking for co-counsel for your malpractice claim? Learn about what Miller & Zois can do for you and your client. What is the most money you can get for a Maryland medical malpractice claim? CALL 800-553-8082 or get a free online medical malpractice serious injury and wrongful death claim evaluations. Miller & Zois handles claims throughout the entire state of Maryland.